Plans for a £100m redevelopment of 1,500 acres on the south bank of the Humber, creating up to 5,000 jobs, have been submitted to the local authority. The massive project includes the creation of transport depots and warehousing, together with offices, a business park and a hotel. 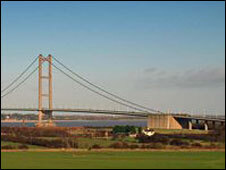 There will also be transport links to Immingham and the Humber Sea Terminal. North Lincolnshire Council said that, while welcomed in principle, the scheme had to go through the planning process. The developers, Able UK, said the scheme would provide a "vital impetus in exploiting the enormous potential of the South Humber Bank." "We have demonstrated our confidence in the potential of the South Humber through our £50m investment in the existing south Able Humber Ports Facility," the firm added. "We expect to invest a further £100m into the development of the north facility and the overall investment coming into the area is likely to be in the region of £1.5bn, with around 5,000 jobs created by the time the project is completed in 2020." Mark Kirk, leader of North Lincolnshire Council, said: "In a time a of recession this is a vote of confidence, not just for North Lincolnshire but for the whole Humber ports region."